Trained and Experienced – Air heat pumps provide space heating and cooling at affordable prices, but must be sized correctly for optimum efficiency. Barone's Heat & Air, LLC has designed and installed air source heat pump systems in buildings of various sizes, and our fully trained staff is equipped to handle your project. Let us help you discover the benefits of this heating technology and trust our years of experience to ensure your heating system runs well. Satisfaction Guarantee – Barone's Heat & Air, LLC also offers a trustworthy satisfaction guarantee, ensuring your heating and cooling system runs at peak efficiency. 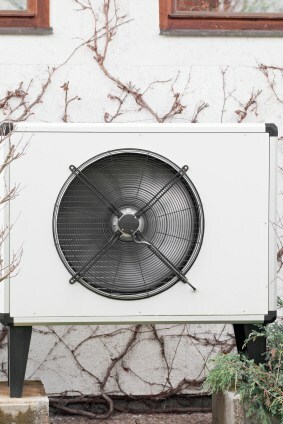 Air heat pumps must be designed properly and may require an auxiliary system for complete reliability. Barone's Heat & Air, LLC technicians will assess your needs, and discuss the best solutions, working hard to keep your heating and cooling costs to a minimum without sacrificing comfort. Call (417) 232-0017 for details on Barone's Heat & Air, LLC’s guarantee. Affordable Rates – Save money on repairs, replacements and upgrades to air heat pumps of any size by hiring Barone's Heat & Air, LLC experts to handle the job. We strive to provide value for our customers with affordable rates and superior service. Find out how an air source heat pump system installed and maintained by Barone's Heat & Air, LLC can save you money. Hire Barone's Heat & Air, LLC and take advantage of experienced staff working at affordable rates with a value-added satisfaction guarantee. Call (417) 232-0017 today for a quote on servicing air heat pumps of any size.